27″ x 35″, Signed Bouvier De Cachard. Buyer pays for shipping. Regis Bouvier de Cachard was the son of the French aristocrat Count Gustave Regis de Bouvier de Cachard de Montmeyran and his wife Simone Vuillaume. Regis was born in Paris, France, 1929.He won a drawing competition in the Parisian newspaper “Aujourd Hui” aged 11. At age 14, he became the youngest student ever to enroll in the Ecole Boulle, and he found himself with students aged 17-25. His tutor for Grauvre Au Burin, Danjon, said Regis engraved like Rembrandt.When he left the Ecole Boulle, Regis De Cachard worked for the Marchesson Textile Studio designing on silk for the Haute Couture. He became one of the top textile designers of Paris for about 10 years. 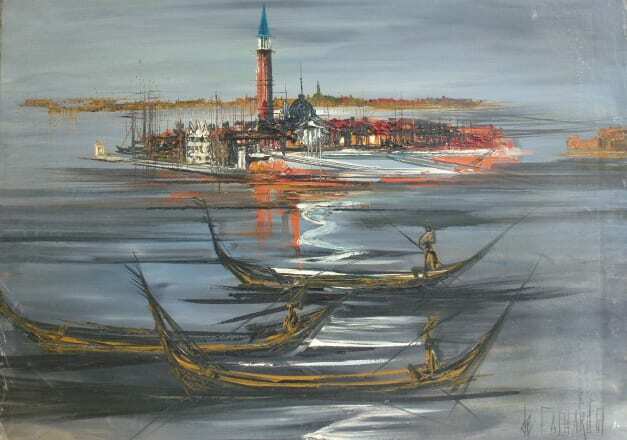 After a car accident he abandoned his career, left his first wife, and went to Venice without telling anyone.Mesmerized by the beauty of this city, he started to paint and was immediately successful. His paintings were bought by the director of the Hotel Gritti and George Prade, collaborator on Salvador Dali’s book “The Apocalypse” when Prade was consel municipal of Paris. De Cachard’s paintings were also purchased by Pierre Christian Taittinger, Mayor of Paris, and Philippe Menard, Director of the Paris Restaurant, Maxims, where Regis dined regularly.His work was also bought by Americans and came to the attention of American dealers Sol Saperstein in New York and and Martin Lowitz in Los Angeles.De Cachard arrived in London 1957 where he met Sheila Woods. They were married in Chelsea in 1959 and left almost immediately for the USA, traveling to New York on the Queen Elizabeth and then driving across America to California. There he worked successfully with Martin Lowitz, who sold his paintings to members of the “Rat Pack” whose celebrity members were Dean Martin, Frank Sinatra, and Peter Lawford.De Cachard was a distant cousin of Jacqueline Bouvier Kennedy Onassis, whom he met at Harry’s Bar in Venice, and he painted a posthumous portrait of President John Kennedy shortly after his assassination. The portrait was donated to the Kennedy family by Martin Lowitz.The De Cachard’s divided their time between studios in California, New York, and London, Venice, Normandy, and St. Tropez for the next 10 years. In London he was patronized by the English aristocracy and business tycoons. He sold paintings to the Duke of Bedford, Lord Charles and Lady Phillipa Chelsea, Lady Primrose Cadogan, Lady Melchot (British Steel Corporation), Lady Tavistock (Woburn Abbey), The Vesteys, and the Sassoons (Private Bank). In the 70’s although based in London with another studio in Somerset, he worked on a series of strangely prophetic paintings of animals and surrealist landscapes inspired from the rural beauty of the English countryside which concealed the horror of factory farming and the resulting epidemics of mad cow disease and the mass slaughter of pigs, sheep, and cows. His paintings of severed heads of animals screaming their last gasp of protest were omens of what was to come. 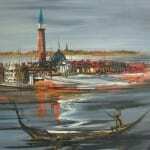 He also lived and worked in Venice and Spain. In 1971 Colin Wilson (author of “The Outsider”) met Regis in London in his old Brompton Road studio. He became a close friend of the de Cachard’s often staying with them on his trips to London. 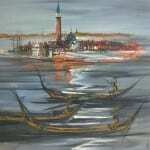 His love for Venice has remained a theme throughout his stylistic evolution. His works inspired from nature, animals, birds, flowers (sunflowers and lilies) reveal a visionary and mystic influenced by the poets and philosophers William Blake, Apolinnaire, Nietsche and Rimbaud. Towards the end of the 70’s De Cachard became increasingly reclusive. He sold his house in Somerset, and from his London base he traveled to Corsica where he spent some time in the early 80’s. He remained in London until the sudden and tragic death of his wife Sheila in 1992. As she lay dying from cancer he did an extraordinary series of portraits of her every day during the last month of her life. He spent the next eight years in isolation and unrest, moving from London to Somerset, and three years in Lyme Regis, Dorset overlooking the famous Cobb and Harbour. He took solace from the sea, painting a series of seascapes and seagulls. It was only in the year 2000 that he felt he had returned from a long and lonely journey and come to terms with his terrible loss. Although intellectually he is more at home in an Anglo-Saxon environment, he now divides his time between his studio in a medieval village perched on a hilltop overlooking Provence and the distant mountain of St. Victoire and Britain. In 1997 Regis made the unpleasant discovery that for over twenty years most of his works sold in public auctions had been mistakenly attributed to his nephew Alain Bouvier de Cachard (painter’s name Raya Sorkine). Regis met with the director of Benezit in 1998 to explain the problem. He was inscribed in the 1999 edition, but damage to Regis’ auction records had been done, the result of the confusion and lack of information on Regis. “Davenport’s Art Reference and Price Guide” Gold 2003/2004 edition has a notation about the identity confusion and an updated auction record.